It will take me awhile to get back. Do not expect an immediate response. I am out there working. Don't walk into one without a gambling strategy. When asked what it takes to be successful as a professional card counter, most people are surprised at the simplicity of my answer. What they miss is the psychological penumbra that envelops it. Play good games. In Chapter 2, I showed you how to determine the house edge based on the rules for any given game. Playing a game with a starting edge worse than -0.8% or -0.9% is a waste of time. Conditions for improving a game, penetration, etc., was covered in Chapter 5. Obey the rules. 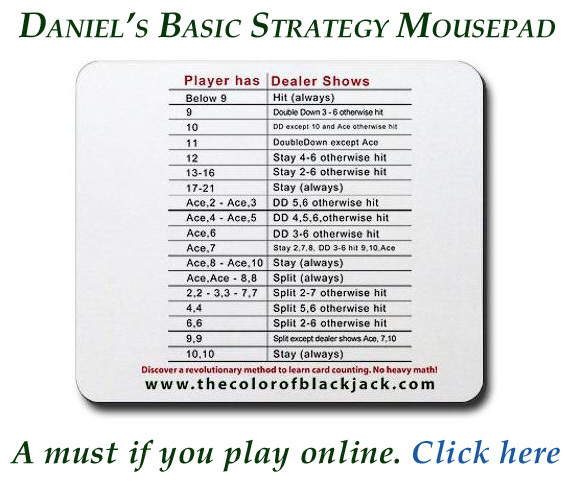 This means basic strategy, index plays, bet spread, and bankroll management. Put in your hours. Treat it as a job and have a good work ethic. This is not a profession I recommend. There are very few full-time card counters, far less than touring pro golfers. What most don't realize is how the psyche comes into play regarding the money swings and the loneliness of the job. I will sometimes be on the road for weeks without talking to another pro. You must have a positive attitude and confidence in your skills. You need self control and discipline. You must know how to roll with the punches and be slow to anger. However, card counting can also be an interesting, fruitful and exciting hobby. One that makes money rather than consumes your savings. It will certainly keep your mind exercised and sharp. I know many weekend counters who are as avid as weekend golfers. It can be great fun. Next, I have spent considerable time illustrating the gain of TKO over KO, but not the gain over other systems. In their excellent book, Knock-Out Blackjack, Vancura and Fuchs clearly demonstrated in computer simulations how well KO stood up to the others. KO yielded an ev of .62% in a 6D shoe sim, and it's major competitors yielded .61%. There were three other systems listed in the sim that offered evs of .63%, .65% and .68%. They were systems that required side counts and were two level, which means that the assigned card tag values were +1 or +2; and -1 or -2. In addition to keeping an RC with those tags, you would also keep a side count of how many aces were played, and then do the TC division. In a single deck game, I grant you that some could keep up. In a shoe, very unlikely. Fatigue, distractions, etc., will produce an error rate. A computer makes no mistakes and will give you that .68%. Play just an extra two hands of KO per hour, and you will have recouped the difference anyway, so it is hardly worth the effort. TKO with my simple Warm Line concept gains so much extra ev that it will surpass the computer-perfect, two-level systems. This sentence will mean nothing to you now. But put one thousand hours of blackjack behind you and come back and reread it.